The holidays are upon us. It’s time to welcome cozy nights filled with friends, family, and plenty of joy. What everyone is hoping not to welcome is holiday back pain. When you think about it, the holidays are a prime time for people to experience back pain. The holidays knock most people out of their daily routine, between the traveling, decorating, and plenty of shopping. Below are a few common causes of holiday back pain. If you prefer to shop in store, we recommend that you dress comfortably. That means supportive shoes and clothing you can easily move around in. Opt for a smaller bag or empty any unnecessary items from your purse to lighten the load. Don’t try to carry too many bags at once. Instead, make frequent stops to unload at your car. And most importantly, take breaks. Take a moment to have a conversation on a bench and truly enjoy the holiday season. Now that you’ve purchased all of your gifts, it’s time to wrap them. While it may be appealing to sprawl out on the floor with everything, we recommend against doing that. Sitting on the floor often encourages poor posture, which is exactly what your body doesn’t need after a long day of shopping. Try wrapping your gifts at a table instead, ensuring your posture is correct. And remember to stand up to lift gifts from the floor to the table. Twisting in your chair at an unnatural angle to pick anything up is a recipe for back pain. What are the holidays without a little holiday cheer strewn about the house? But before you start to decorate the entire house by yourself, we urge you to get help. Putting up a tree is much easier with two people. Also, remember to reach within your limits. Avoid straining to place a decoration outside of your reach. 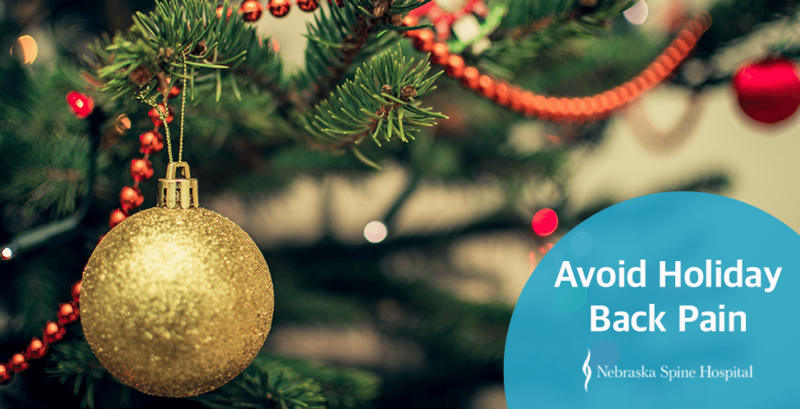 We hope the tips above can help you celebrate without holiday back pain. If you or a loved one is experiencing back pain, please reach out to your physician.